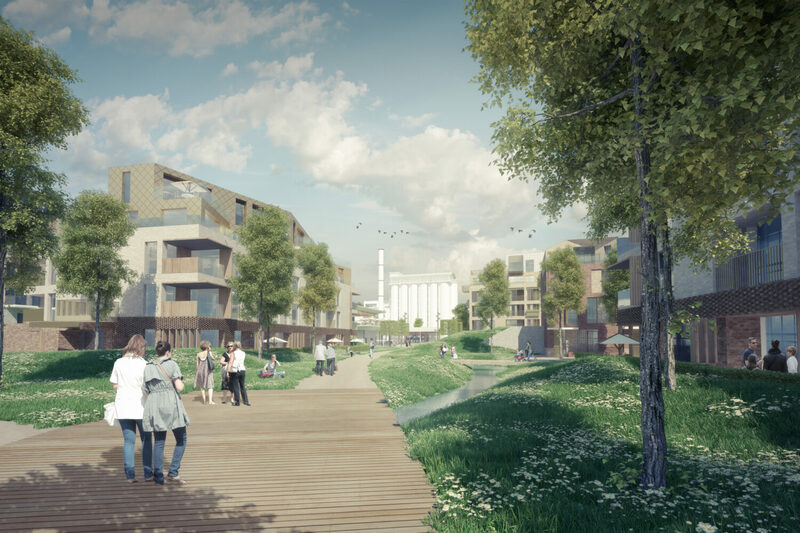 EPR Architects’ proposals for the redevelopment of the former Shredded Wheat Factory site in Welwyn Garden City have been approved. The scheme will deliver 850 new homes in the heart of the town’s centre and will convert the original - now listed - 1920’s Shredded Wheat Factory buildings into new office space, retail and a crèche as well as reinventing the 25m tall grain silos for boutique hotel use. EPR Architects’ vision for this new urban quarter of Welwyn Garden City has been closely guided by Ebenezer Howard’s original Garden City principles but with a modern interpretation; greenery, open space and a sense of community feed through all aspects of the masterplan, offering a new approach to patterns of living and working that reflect todays aspiration for a healthy lifestyle. An integral part of the masterplan for this historic 20 acre site is the restoration of the modernist production buildings, bringing them back to their former glory. A new publicly accessible formal garden space will provide an apt setting for the reinstated grand entrance of Louis de Soissons’ revitalised Production Hall building and associated grain silos, which will once again be celebrated as one of the main focal points of Welwyn Garden City.